Established in 1980 and servicing companies pallet requirements in Norfolk, Bedfordshire, Hertfordshire, Cambridgeshire, Nottinghamshire, Buckinghamshire and Northamptonshire supplying wooden pallets throughout East Anglia and the rest of the UK. KB Pallets manufacture and supply pallets to businesses in small or large quantities of both new and used wooden pallets. 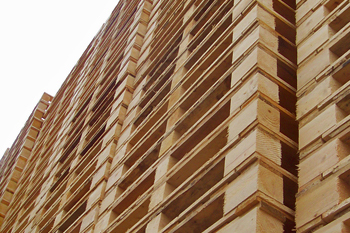 We manufacture our new pallets on-site and repair, recondition used pallets. Our computer aided design and production equipment is easily adapted to small quantities. This state-of-the-art equipment allows for quick response and precision manufacturing. ISPM15 Heat Treated New & Reconditioned Wooden Pallets Throughout The United Kingdom. KB Pallets are renowned for the manufacture of high-quality Wooden pallets and speedy delivery throughout the United Kingdom, we pride ourselves on our good reputation. It will cost your company nothing to get a quote from K.B.Pallets now online and we will save you money with your first order. If you have any enquiries then please do not hesitate to telephone Simon Biddle or alternatively send us an email via our Contact Us page. Our hours on business are 8.00am to 5.30pm Monday to Friday and 8.00 am to 12.00 pm on Saturdays.